It’s been a back-and-forth season for both Boulder City soccer programs this year, but both the girls and boys programs have shown progression. For the Lady Eagles (2-8-2 overall, a sign of progression appeared this past week when they came from behind twice to tie second-seeded Sunrise Mountain 2-2 and nearly had a chance to come away with the upset before a potential game-winning goal from senior Jeanne Carmell hit the crossbar with just under three minutes to play. Knocking Sunrise Mountain out a potential No. 1 seed in the conference, both senior forwards Paige Buettner and Jordyn Trobiani would score unassisted second half goals during the contest. 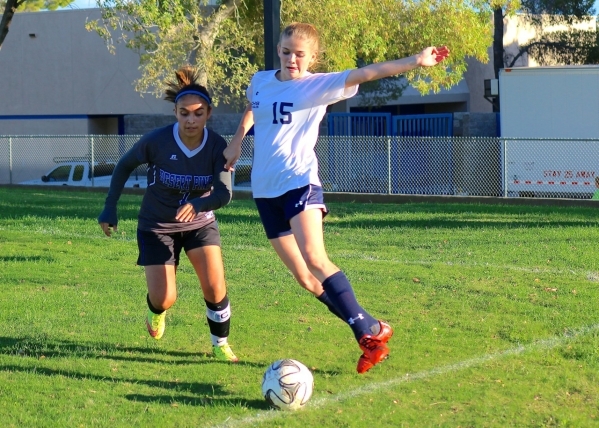 Following last Wednesday’s performance against the Miners, the Lady Eagles finished their week with a 4-0 loss to third-seeded Southeast Career and Technical Academy and a 1-0 loss to fourth-seeded Desert Pines. For the boys while improvements have been made thoroughly throughout the season, the Eagles (1-13 overall, 1-10 league) hit a rough patch this past week against three potential playoff teams. 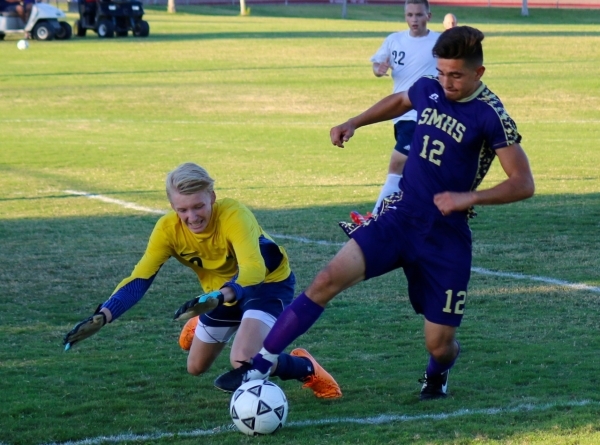 Handed three defeats over the past week, the Eagles were shutout against third-seeded Sunrise Mountain (11-0) and fourth seeded Southeast Career and Technical Academy (9-0), before falling to second-seeded Desert Pines 6-1 on Tuesday. Heading into the final stretch of the season, both programs will face Moapa Valley on the road today, before heading to Del Sol on Monday and hosting Virgin Valley on Wednesday. With a week to prepare for their upcoming Division I-A Southern Region meet, the Boulder City cross country programs will not only have an opportunity to reflect on this past week’s Sunrise League Finals race, but rest up for their season finale on their home course. Placing second this past week with a team score of 44, the Lady Eagles trailed only Southeast Career and Technical Academy (23) during the eight-team event. Coming together at the right time, the Lady Eagles matched their highest overall team placing during the event, managing to place three runners within the top 10 on Saturday. Sophomore Sierra Selinger continues to make her case for the conference’s most consistent runner, placing third overall on the day with a time of 21:47.8. Selinger, now has five top three finishes on the year, while placing sixth in her other race this season. Behind Selinger was senior EmmaLee Torgesen who finished fourth on the day, posting a career best 21:51.0 for the event. Putting together the best run of her four-year career with the Lady Eagles when it mattered most, Torgesen shaved nearly two minutes off her season best and should provide a nice complement for the Lady Eagles moving forward toward regionals on their home course. Sophomore Camille Torgeson also posted a season best at Boulder City’s League Final, placing 10th with a time of 23:36.1, nearly a minute less than her next fastest result, while junior Nantke Bonsack shaved more than a minute off of her season best in her 15th place finish with a time of 24:17.1. Junior Sabrina Snow, sophomore Lauren Stewart and senior Breanne Harkins would round out the Lady Eagles core, placing 28th, 33rd and 37th, respectively, on the day. Excited to have regionals on their home course this season, sophomore Sierra Selinger feels relaxed coming into the setting, stating that with the course being so familiar, she can now just focus on running her best possible race. For the boys, the Eagles have some ground to make up after this past week’s fifth place finish, but overall had a pair of runners near the top of the pack for the entire event. Junior Tyler Campbell posted his fifth top 10 finish of the season Saturday, placing first on the day with a time of 17:15.9. Posting a career best on Saturday, Campbell’s time was just a minute under last year’s state tournament finish of 18:17.0 where he placed 29th at the event. Heading into next Saturday’s race, it appears Campbell is ready for another trip to state as at least an individual runner. Hoping to join Campbell for a third and final time will be senior Joren Selinger, who competed at the event as a freshman and sophomore, before missing out last season. Placing a season high 13th on the day with a season best 18:54.8, Selinger could give the Eagles two state tournament runners if he continues to drop his times like in recent weeks. Rounding out the boys on the day were sophomores Tyson Morris and Dawson Goodfellow who placed 30th and 37th respectively, while junior Caleb Shamo finished 33rd. The Division I-A Southern Region Meet will be held on Oct. 30th at Veterans Memorial Park, where all 16 Division I-A school will compete for team and individual state tournament berths. Finishing off their season at the individual state tournament at the Darling Tennis Center this past weekend, both the girls and boys tennis programs were heavily represented in the second round of play. In the round of 16 this past week, both Lady Eagles singles competitors junior Natalia Fullmer and freshman Harley Fullmer lost in straight sets, while the doubles tandem of juniors Kyra Yamamoto and McKenna Frazier bowed out in the round of 16 as well. Natalia a seventh seed at the tournament would loss to second seeded Paige Smith of Clark 6-0,6-0, while Harley who entered the tournament as a sixth seed lost to third-seeded Anuja Daulat of The Meadows 6-0, 6-1. Both Smith and Daulat would make it to the third place game, with Daulat coming out the victor. Yamamoto and Frazier entered the round of 16 as a fourth seed but ran into a hot fifth seed of Carolyn DiPasquale and Dina Ciulla from Faith Lutheran in their 6-0, 6-1 loss. DiPasquale and Ciulla would later make it to the championship match, before placing second. Wrapping up their season in the round of 16 for the boys were singles competitors Andre Pappas and Sam O’Berto who were both swept in two sets apiece. Pappas a three seed, lost in straight sets to unranked Ryan McCoy of Sierra Vista 6-2, 6-3, while O’Berto an eight seed lost in straight sets of 6-0, 6-0 to top ranked Michael Pasimio of Clark. Pasimio would end up winning the boys individual title.